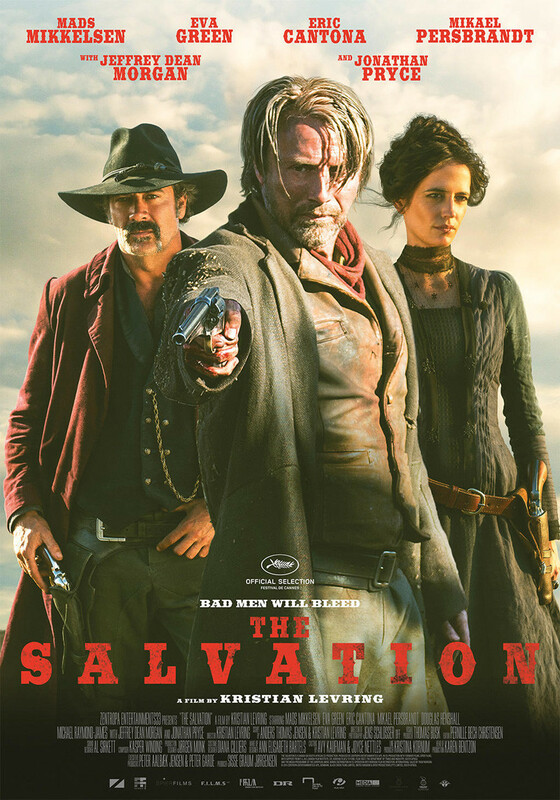 I first heard about The Salvation, an old-school western from Danish director Kristian Levring, when it debuted at the 2014 Cannes Film Festival’s Midnight section last May. My interest was piqued for many reasons, chief among them that the cast includes several of my favorite actors, in one of my favorite genres. Mads Mikkelsen, Jeffrey Dean Morgan, Douglas Henshall and Eva Green made a western. I was all ready to hand over my money, then… nothing. No word since the BFI London Film Festival in October. Finally, on the brink of a (limited) US theatrical release, IFC Films has dropped a US trailer. There is so much to like about it, I’m nearly giddy. As I always say, there’s nothing new under the sun and it’s all in the delivery. That is almost certainly true here. The Salvation is a tale of revenge set in the American West of the 1870s. A former Danish soldier (Mikkelsen), tired of war and looking or a fresh start, emigrates to America and takes his family west. After his wife and son are murdered, he hunts down and kills the men responsible. One of the dead killer’s has a brother (Morgan), with the mustache twirling name of Delarue, now set on his own revenge. Also in the mix is Eva Green as the newly widowed Madeline. So, this could be Death Wish in the Wild West or it could be something more. I’m thinking it’s the latter; not a new spin on a classic western, it IS a classic western – in the tradition of John Ford and/or Sam Peckinpah. I could be wrong. I could be ascribing loftier ambitions to the film, on the basis of the trailer, than Levring intended. But I can’t wait to find out. C’mon, it’s Mads! If all you know of Mads Mikkelsen is as tv’s “Hannibal” (or even Le Chiffre in Casino Royale), I’m not sure we should be talking…I’m kidding! But seriously folks, any self-respecting cinephile is doing themselves a huge disservice if they haven’t checked out his other work. I digress, as per usual. Cinematographer Jens Schlosser, who previously worked with Levring on The King is Alive, (a modern-day retelling of Shakespeare’s “King Lear” with an international cast), isn’t yet known to American audiences, but that may soon change. Take a look at some of the stills below for a closer look at his work in this film. Gorgeous. Hopefully I can see it on the big screen, but if not, The Salvation will get a more accessible VoD release the same day, February 27. This entry was posted in author, Film Festivals, movie news, movie posters, movie trailers, movies, Musings, Posters, S. A. Young, stills, Trailers and tagged Danish, Douglas Henshall, Eva Green, Jeffrey Dean Morgan, Jonathan Pryce, Kristian Levring, Lone Scherfig, Mads Mikkelsen, movie, movie poster, movie trailer, Nicolas Winding Refn, photos, The Salvation, Valhalla Rising, western. Bookmark the permalink. Watch the 1st Trailer for Tomorrowland, Today! Watch Hiddleston, Chastain, & Wasikowska in the Eerie 1st Trailer for Crimson Peak!